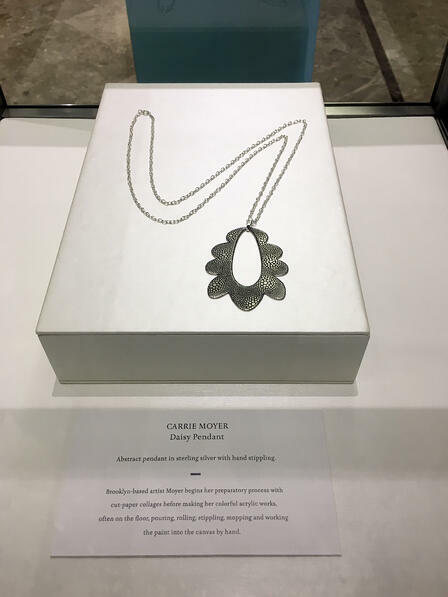 Artist Carrie Moyer created the “Daisy Pendant,” this abstract pendant is made with sterling silver and is hand stippled. Moyer is a Brooklyn-based artist with a creative process that includes extensive preporation. She begins by cutting paper collages for her idea. Once this is done, she will create a colorful acrylic painting usually on the floor. This process involves Moyer rolling, mopping, and working paint on the canvas. Moyer leaves no step undone, which results in her sterling daisy pendant which reflects Tiffany's classic silver jewelry and accessories. 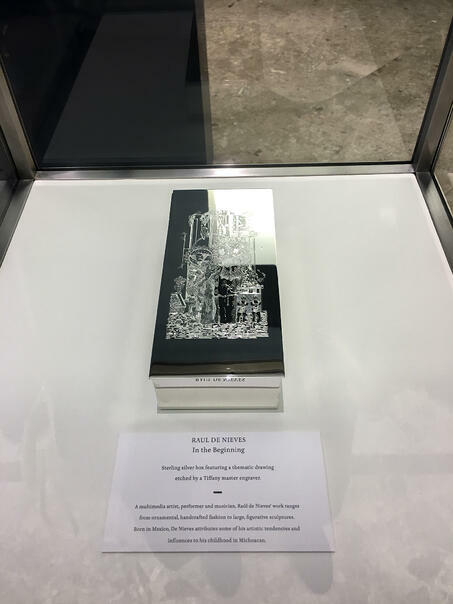 Multimedia artist Raul de Nievs worked with Tiffany master engraver to etch one of his drawings atop a sterling silver box. The piece titled “In the Beginning” is a meeting of skill and artistry. Nievs in an artist of everything from hand-crafted ornamental fashions to large figurative sculptures. He attributes some of his artistic tendencies to his childhood in Michoacán, Mexico. The scene on the box features two figures, presenting a child to the world. This a prevalent theme in his work. 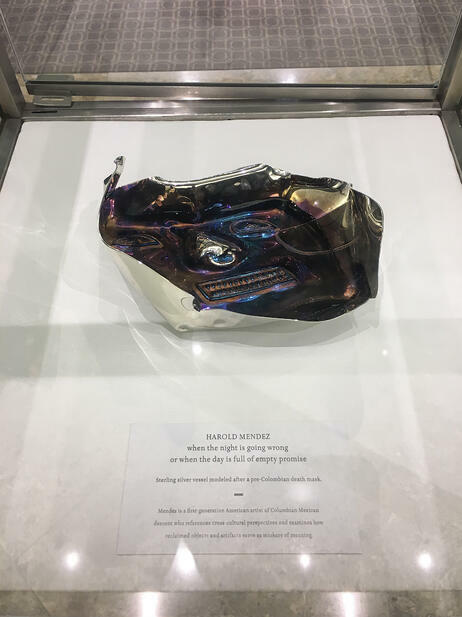 Raul de Nievs "In The Beginning"
Harold Mendez’s “When the night is going wrong or when the day is full of empty promise,” is a sterling vessel modeled after a pre-Colombian death mask. This mask is inspired by Mendez's culture and experiences. 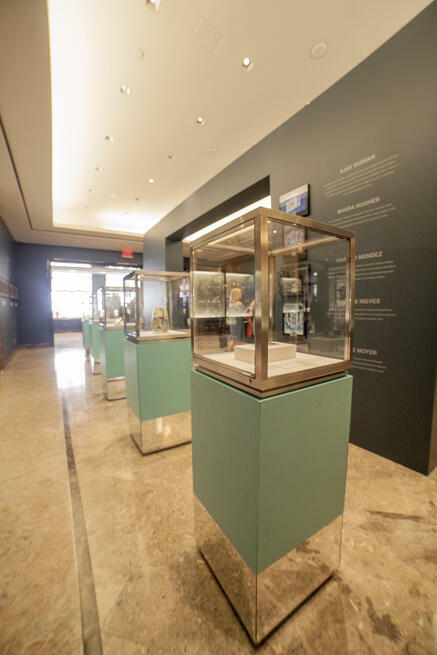 As a first generation American artist from Colombian and Mexican descent, he will often reference cross-cultural perspectives and examine how reclaimed objects and artifacts serve as markers of meaning. Shara Hughes’s “Remote Twilight” features an abstract landscape, hand-painted on a bone china vase. This Brooklyn-based artist uses bold strokes to replicate stunning, fantastical landscapes. Her semi-abstract works beckon the viewer to enter the scene. Hughes is the only featured artist who didn’t work with silver, but still effortlessly showcases her style with Tiffany quality in mind. 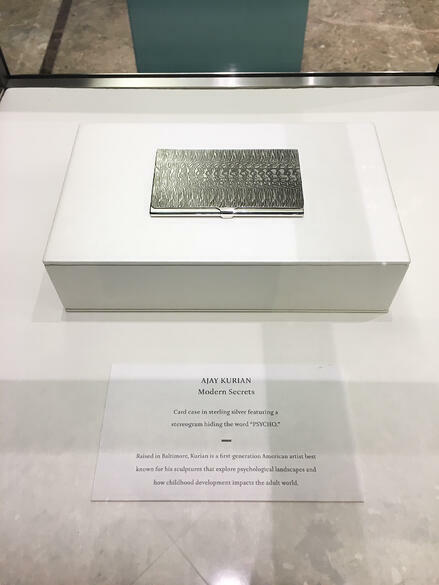 Ajay Kurian’s card case may seem quite simple from afar, but when you take a closer look, his concept jumps right off the sterling silver case. Kurian created a stereogram that is hiding the word “psycho” in the pattern. Ajay Kurian is a first-generation American artist best known for his sculptures that explore psychological landscapes and how childhood development impacts the adult world. Each collection is available for purchase at both Tiffany & Co and The Whitney Museum. 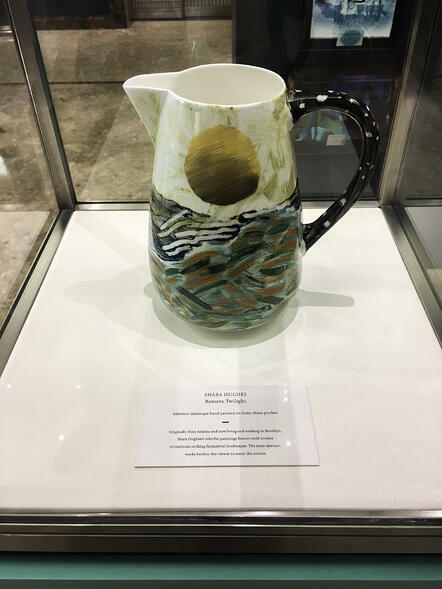 Each piece of art ranges from $3,700 - $10,000. Tiffany and Company founder, Charles Lewis Tiffany and his son Louis Comfort Tiffany, have been purveyors of art since the company’s birth. This collaboration showcases not only Tiffany's classic style, but its ascension toward a dynamic and artistic future.